Hey guys! If you’re reading this, you probably noticed my new blog design this week! It isn’t perfect (yet), but I’m super excited about the new look and layout. *Big thanks to Erika for her great style and tireless work making all my ideas actually functional. * Getting a blog makeover is basically like Christmas to me. I LOVE it. But, it also brings out my perfectionist side, and I suddenly notice every little thing that needs “fixing.” I want to update every old post, photo, tag, etc. so don’t be surprised if you continue to see some changes around here. In the meantime, check out my updated About page and the pull down menus under each of the main categories – Motherhood, Teaching, and Life In-Between – and let me know what you think!! I’ve tried really hard to make this blog a reflection of me, and the design a reflection of what this space is all about. I hope it will be even easier to navigate and find exactly what strikes your fancy now. While we’re on the topic of blogging, I thought I’d respond to some of the questions I occasionally get about starting a blog… I’m obviously NOT an expert (not even close), but I have been doing this for a long time (seven years this summer which will officially beat out gymnastics as my longest-standing hobby) and have learned a lot along the way. I hope this will be helpful to someone out there! Think about your blog’s purpose and choose a name that matches it. This is something I wish someone had told me before I got started. I spent all of ten minutes thinking about what to name my first blog, and then didn’t really love the name the entire time I was writing there. (As if blogging isn’t already narcissistic enough without a name like “E, Myself, and I”.) When I lost my domain and re-branded / started this blog in 2014 (read about that here), I was MUCH more intentional about what I wanted the blog to be about, and I chose a name that fit that. I’ve been so much happier with my new name and a more defined purpose/niche for the blog. Once you’ve answered those questions, you might even go so far as to think about how you’d describe yourself and your blog on an About page, what your “tag line” will be, and what categories you will organize your posts into. It’s probably even a good idea to go ahead and write your first few posts to get a feel for your voice and the style of your blog. These thing will naturally point you towards a blog name that fits! Figure out what your boundaries are going to be and set them from the beginning. When I first started blogging, I just assumed that no one would ever really read what I was writing besides my mom and a handful of friends that clicked over from my Facebook page. As a result, I was sharing things on my blog that I would share with my mom and a handful of close friends. In theory, there is nothing wrong with that, but it’s really important to remember that once something is published on the internet, no matter how hard you might try, it’s really hard (impossible maybe) to get it off the internet. Thankfully, I never wrote anything I’m particularly embarrassed or ashamed of, but I have wised up in my old age and started thinking about what kind of information (about myself, my family, my job, etc.) I’m comfortable having on the internet for the rest of the time. In addition, it’s important to set some privacy/safety boundaries for your content from the very beginning – like deciding whether or not you will share your real name, your full name, your employer, your location, photos of your kids, etc. It’s sad, but you really have to be careful even when deciding whether or not to mention when you are going out of town for the weekend or your husband is traveling overnight. This could be a whole post on it’s own, but we do live in a dark world during a changing time. There is a fine line between accepting how common internet presence is today, and recognizing the dangers of putting everything out there for all to know. It’s a good idea to enlist the help of your spouse (or someone else close to you) and talk through these topics, imagine potential scenarios, and even write down some specific boundaries if you want to go that far before you ever even start publishing on your blog. I’ve learned (here, for example) that it is a lot easier to set a precedence from the very beginning than to try to go back and “censor” later on, and you just never really know WHO or HOW MANY people might be reading your blog one day. Get involved in the blog world. It’s true that in order to BE a blogger, you need to READ BLOGS. The blog world is BIG but also very small really. One of the best ways to get started blogging and to get your blog noticed is to get involved! Find some blogs that you really love, and leave thoughtful comments on their posts. Share other people’s writing on your Facebook page (or on your new blog). 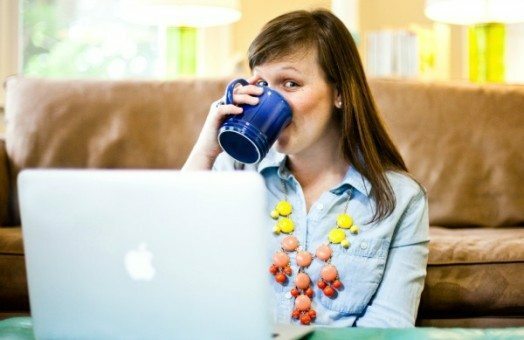 Email a blogger that you respect and introduce yourself or ask for her advice on a particular subject. It’s called “social” media for a reason – don’t be shy!! One word of warning about this though… Make sure your connections are authentic. It’s generally considered “tacky” to link to your own blog in someone else’s comments (unless you’ve written a post that is particularly relevant, etc.) or send an email that just says: “Check out my blog.” I have found the blog community to be one that really stands by each other and WANTS to see each other succeed, so building others up often naturally builds your own brand. HOWEVER, it can’t be contrived or “fake.” Remember, even when blogging becomes “business,” we are still humans, and the human side of blogging really thrives on relationships! I can genuinely say that in my seven years of blogging, I’ve made some true FRIENDS that I’ve never actually met in person – and a few that I have met but never would have if it wasn’t for blogging. This is – BY FAR – the biggest blessing of blogging, and it far outweighs any of the other “perks.” Don’t miss out on that by trying to comment everywhere and be involved on EVERY blog. Pick a few blogs that resonate with you and get to KNOW them and the bloggers behind them. It will pay off in more ways than you’d imagine! This may seem silly or trivial to some, but it makes a big difference to me… Don’t you want to be home more when your house is clean and decorated nicely? Aren’t you more productive when your desk is neat and has a beautiful vase of flowers or a cute coffee mug on it? Your blog is no different. I’ve been paying for blog design for almost six years now, and it has made SUCH a difference. There is just no comparing a professional blog design to something free and/or sloppily hand-done. Yes, this requires a bit of an “investment” up front (full blog design can cost anywhere from a few hundred dollars to a few thousand depending on what you want), but if you are a serious about blogging, I think it’s well worth it. (Email me if you want some recommendations for designers.) If that absolutely isn’t possible right now, however, don’t let it stop you from starting a blog all together. There are great tutorials on You Tube, and I highly recommend PicMonkey* for designing your own graphics etc. I’ve never tried them, but you can also purchase pre-made templates on Etsy (usually at a much lower rate) and many of them look great. The wonderful thing about blogging is that there really is room for everyone. Don’t try to be anyone else on your blog. Tell your own story. Write in your own voice. My goal is to be the same person on my blog as I am in real life. If we met for coffee next week, I don’t think I would surprise you. (Or, as one blog-turned-real-life friend once told me, “You really are as big a mess in real life as you claim to be on your blog!” Ha!). If you are funny, be funny. If you are more serious and deep, be serious and deep. Be vulnerable with your mistakes, and don’t be afraid to laugh at yourself. You really do have something that NO ONE else can contribute to this space. Yes, I gave you a million and one things to think about before you start a blog, but the hardest part really is just hitting publish! You don’t have to (and you won’t) have everything perfect from the very beginning, but you have to start somewhere! Set up a free site in Blogger (I recommend that you start there though there are equally strong arguments in favor of Word Press from the beginning) and start typing. If you are still working through some of the above questions, you can always start as a private blog and not make it public until you have everything else the way you want it. It will never hurt you to have more content. Honestly, I’ve said this plenty of times before, but blogging has been SUCH a blessing in my life. In addition to relationships and a little bit of extra spending money, it has given me a voice, a story, and a passion for writing that I lost somewhere between middle school and a master’s degree. 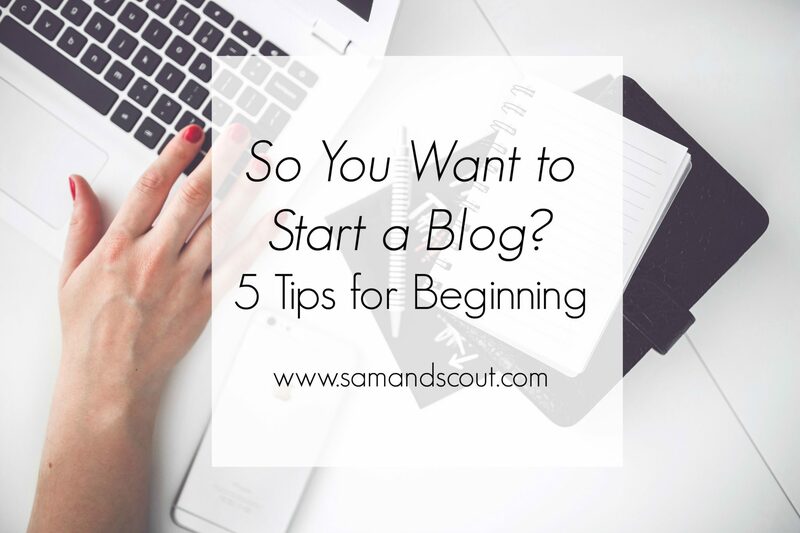 I would encourage anyone with even with the slightest bit of interest to jump in and start a blog. The more the merrier! Well, there’s my long-winded advice for someone considering starting a blog… What other questions do you have? Should I do more of these types of posts about blogging itself? Are there specific areas you’d like to hear more about? Those of you that have been blogging for a while yourself… What did I miss? What would you add to my list of advice for someone wanting to start a blog? *FYI, this post contains an affiliate link. See my full disclosure in the sidebar. What a great list. I finally started my first blog yesterday and this post popped up at the perfect time for me. Thank you! I love your list, and I love that it didn’t include anything like “create pinterest-worthy content or anything like that. I love your consistent, authentic voice. Love this! I haven’t blogged at my (I guess “current”) blog for a long time, and just yesterday I was brainstorming a new venture. I’m going to bookmark this page and keep it in mind as I develop my new project. I especially love your tip about talking through privacy and subject matter issues with your spouse. That’s SO important. Also, I think your new design is lovely, and I always enjoy reading your posts. Thanks for doing what you do! Even though I’ve been blogging for a few years I still feel like a newbie – so I’m taking your advice and commenting! My favorite blogs to read are absolutely the ones where I feel like I KNOW the writers, where their personalities and quirks come alive. Thanks for reminding me to write exactly the sort of thing that I also want to read.